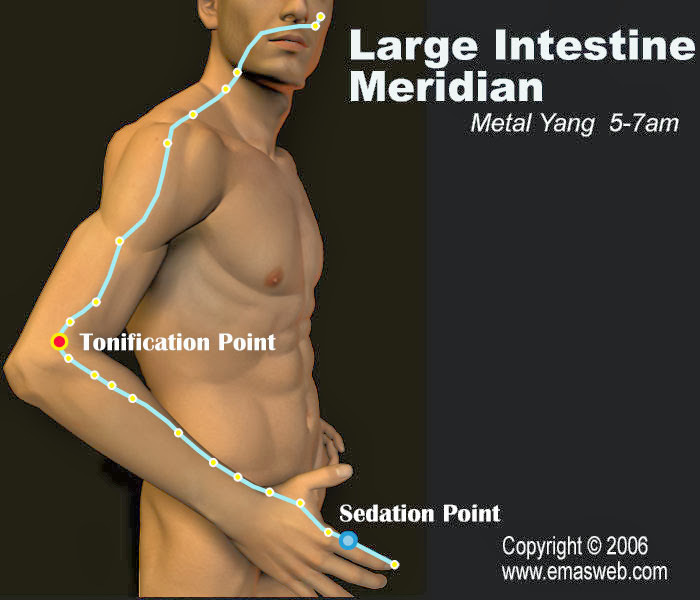 The Large Intestine Meridian connects with the Lung Meridian, with which it is externally-internally related. Abnormalities of the Large Intestine Meridian will result in diseases such as abdominal pain, borborygmus, diarrhea, constipation, dysentery, etc. In addition, the Large Intestine Meridian goes through the mouth and nose, so toothache, runny nose, or nosebleed may appear. Pain and swelling along the pathway of the Large Intestine Meridian might also show abnormality of Large Intestine Meridian. Because of the internal-external Meridian relationship with the Lung Meridian, many problems of the Lung Meridian will also affect this Meridian. When the Large Intestine Meridian has abnormal circulation, there will be symptoms such as toothache (not dental caries), distention and pain of neck, rough skin, nasal obstruction, nosebleed, etc. Some patients may have pain or restricted movement in the shoulders and upper back. Peak qi and blood flow in the Large Intestine Meridian is from 5:00 am to 7:00 am. 1.Abdominal diseases originating in the stomach and intestines. 3.Some diseases resulting from heat. 4.Diseases of the eyes, body, mouth, teeth, nose, or throat. 5.Diseases along the course of the Large Intestine Meridian.